Well, this is the last report for summer. 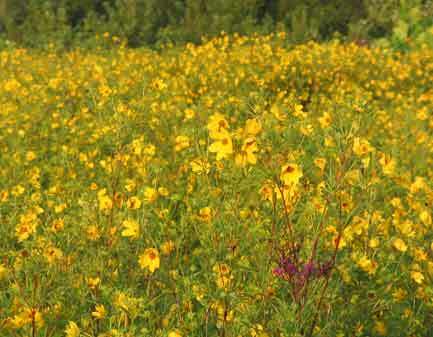 Got in a lot of fishing and saw lots of deer and birds and flowers and seeds. 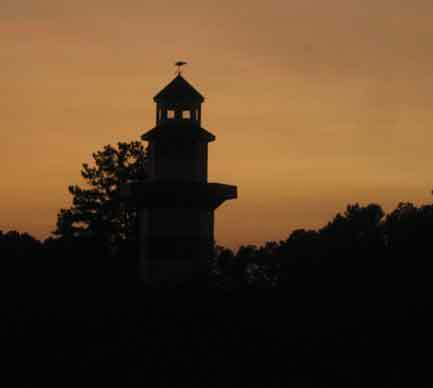 The days are getting shorter and the sun is moving south. It's been a cool and wet summer. A good one. We'll look back with longing when the dark cold days come. But it's all good. 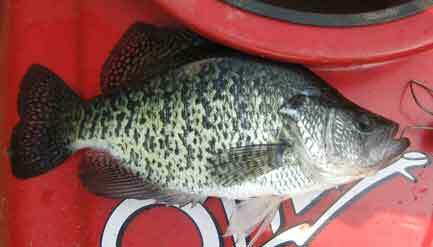 Fishing for bass and trout below the dam at Center Hill and this nice crappie decided to give me some action. 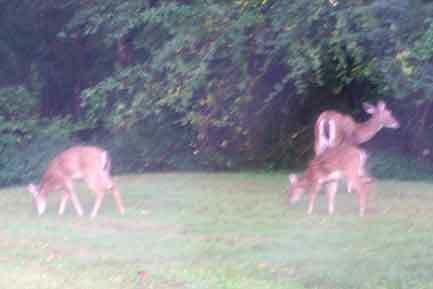 On the way up the hill near the manager's house saw these little guys and mom. Early and still pretty dark at SB. 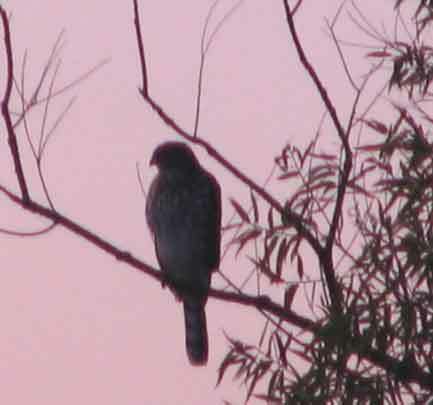 This Cooper's Hawk just sat and watched. 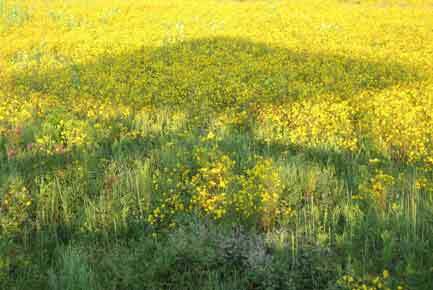 When the sun was just over the horizon it threw the shadow of the pavilion into the huge field of yellow flowers which were at their peak this first week of September. Yellow is my favorite color. What could be nicer? 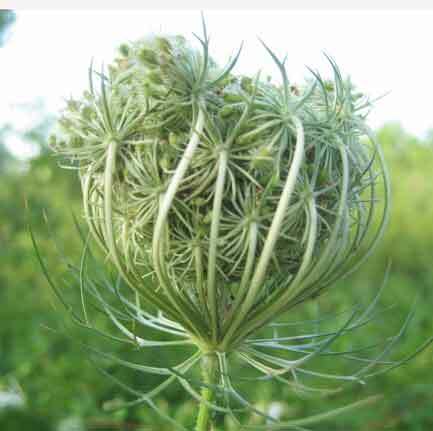 The flowers are turning into seeds and soon will fall or be eaten by birds and other creatures. Fall is coming. This corner of the pavilion looks east and the sun is now coming up to the south of the line I draw across these two posts. Not too long ago it was well to the north of that line. It's still dark and the mist is thick but you can see the beavers have been working on the willow trees across the pond. 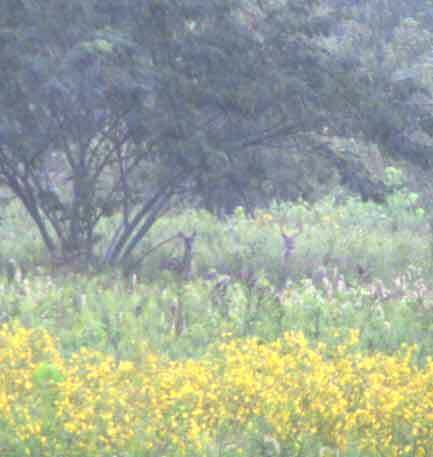 This doe and buck were lying under the shelter of the big mimosa across the field to the east on a rainy Thursday morning. Friday from the deck we spotted this family of ducks. 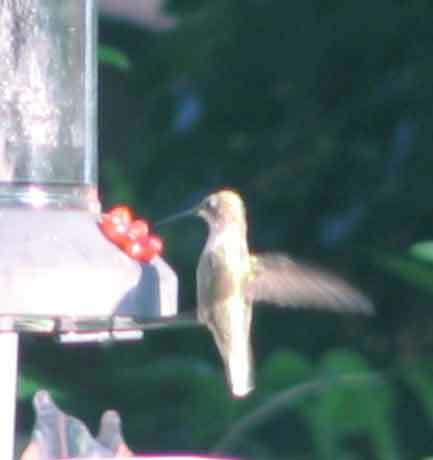 Late Saturday afternoon this female hummingbird visited the feeder. 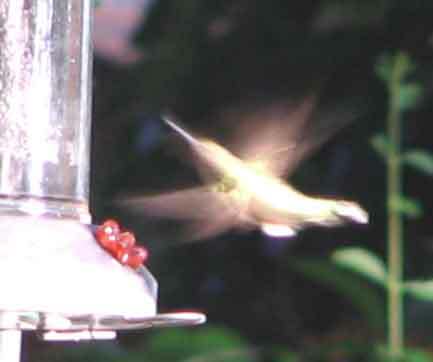 We finally have hummingbirds now. Two females share the feeder without too much conflict. They dive bomb one another, but not enough to bother either. Sunday at Creek K this osprey decided to fly just as I clicked. 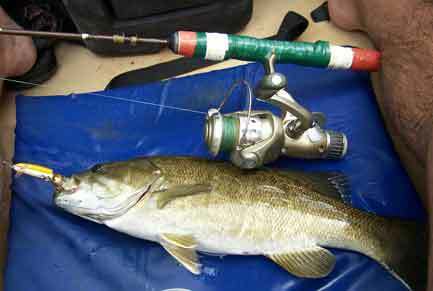 Best small mouth of the year. Almost 18 inches. What a fight. They are all active now and I've been catching 5 or 6 every trip. Really rainy and dark on Tuesday morning. 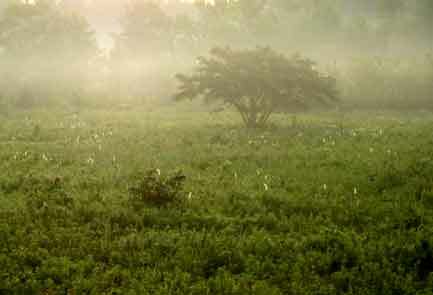 The huge mimosa is just visible. A little later a goldfinch works on his wet feathers in a willow. 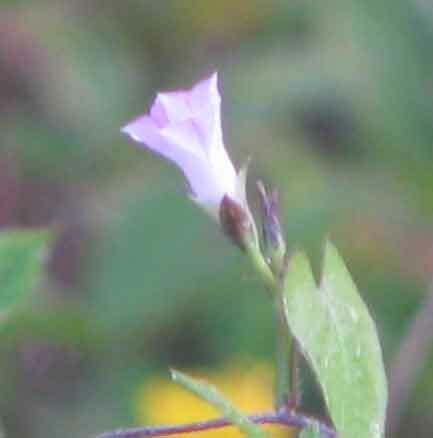 A tiny flower on a climbing vine. What is it? Don't know what they are but shiney with rain they are lovely. 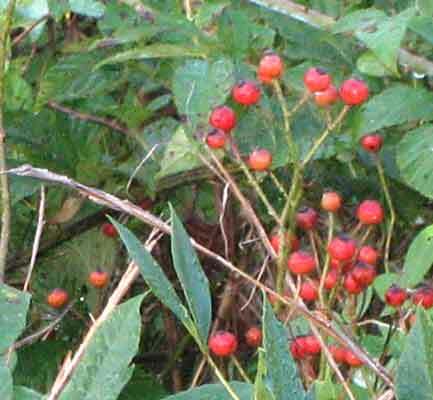 The wild roses are full of hips. 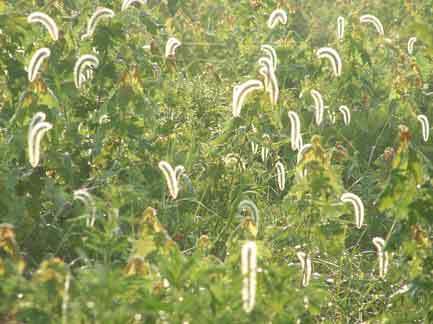 And what are these? There are thousands in the big open fields. 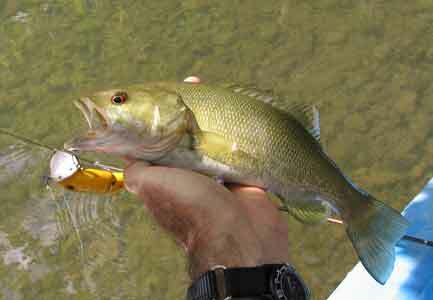 Up in Creek K where the water is shallow the broken back rapala worked well for small mouth. Sunday at Center Hill. 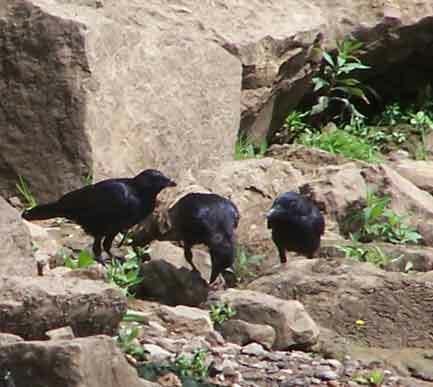 These crows make sure no guts or heads are wasted. 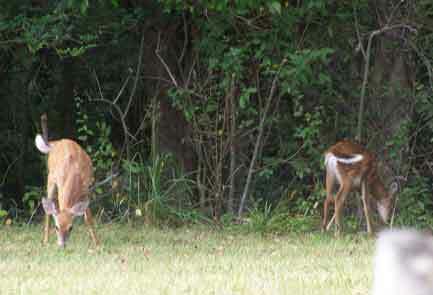 Saw the doe and twin fawns again on the way up the hill Mama looks a bit thin. 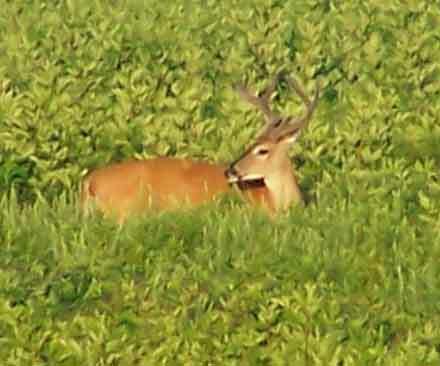 Those big fawns are due to get weened soon. 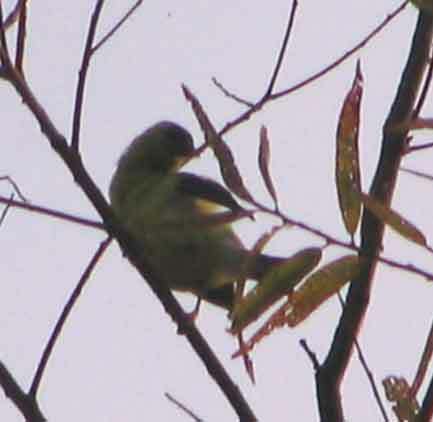 Mystery bird. 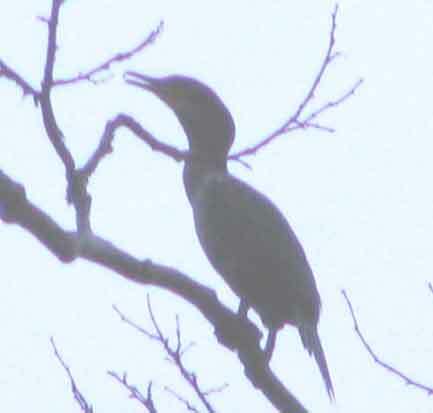 On the deck Saturday late and this bird landed high up in the sycamore tree. We think it is a comorant or a merganzer. Anyone know for sure? Sunday on the creek was rainy and I spent a lot of time putting on and taking off my rain poncho. 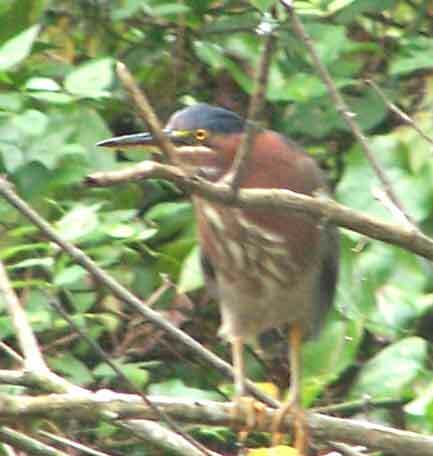 On the way back I saw this little green heron who let me get a lot closer than normal. Maybe the yellow poncho disguised me. 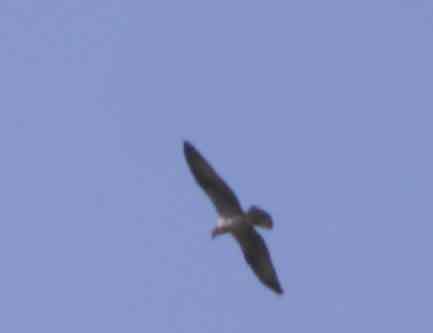 It flew, but not very far, so I got this shot as well. 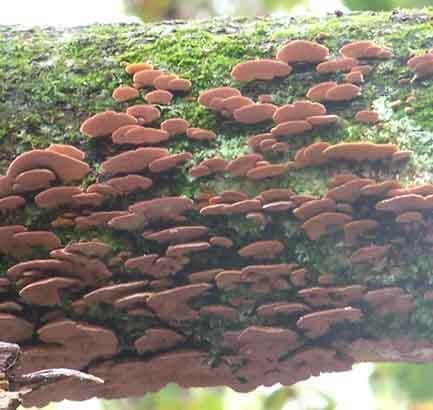 Interesting growths on the moss of a dead tree. 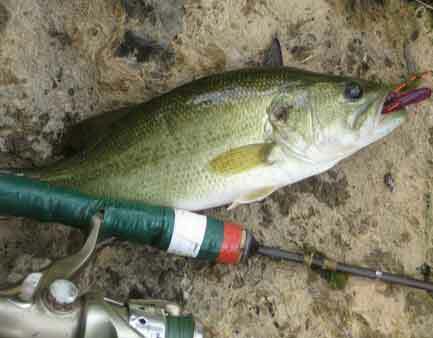 Near the mouth of Creek K this 14 inch large mouth fell for the frog colored chugger. 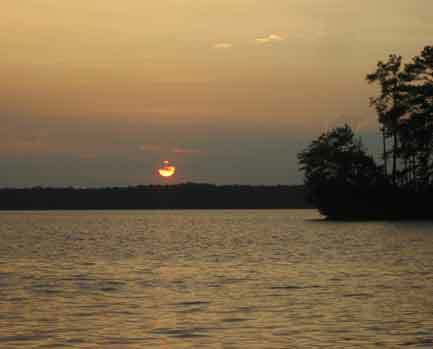 Great day, except that the fish were taking a break and it rained about half the time. Only caught 3 or 4 small ones after this. No matter. Just being out and seeing all the sights made it a good day. 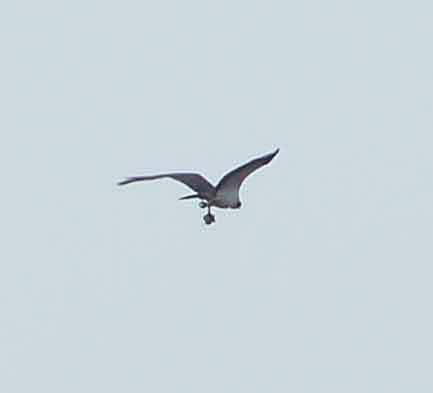 Near the take-out I got a photo of the osprey flying home with supper. Last day of summer and what a great day to be alive. It's been a great Summer, full of all the things that make life worthwhile. Have to believe that God is good..
Well, I'm finally caught up. Here are the last of the backed up photos. Hope you enjoy them. 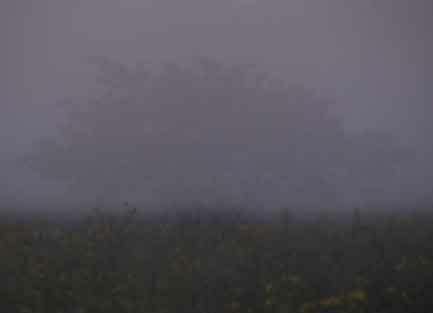 The one below, which I call "Foggy Morning" was such a lucky shot I wanted to show it in detail. 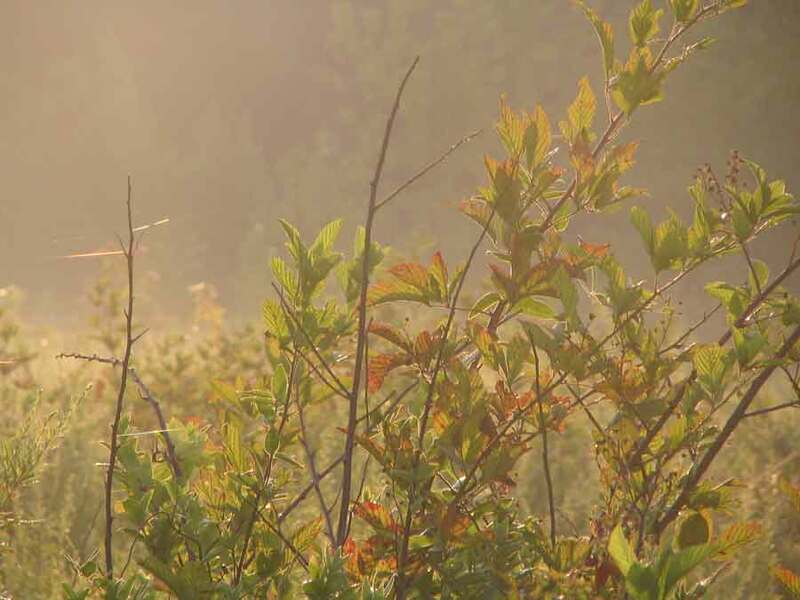 The sun was just barely up and shining through the dense fog to backlight these blackberry canes and leaves. 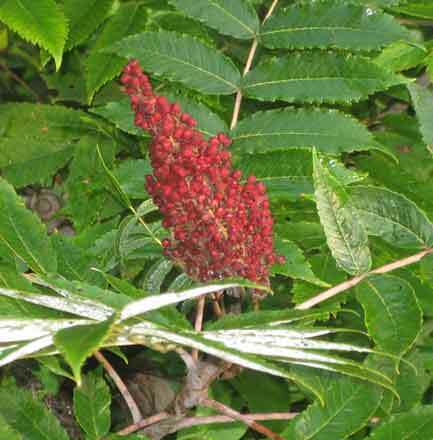 Sumac berries are ripening. We used to make "Indian Lemonade" from them. If you soak them in water it give the water a lemony tang. 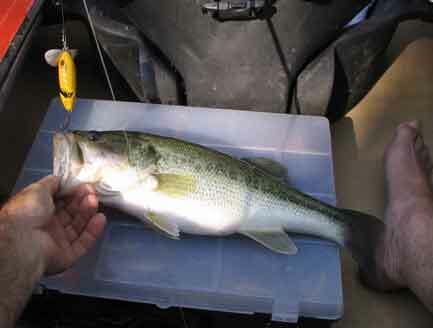 This largemouth fell for the old jitterbug, but the cooler weather is making it too noisy for the more alert bass. 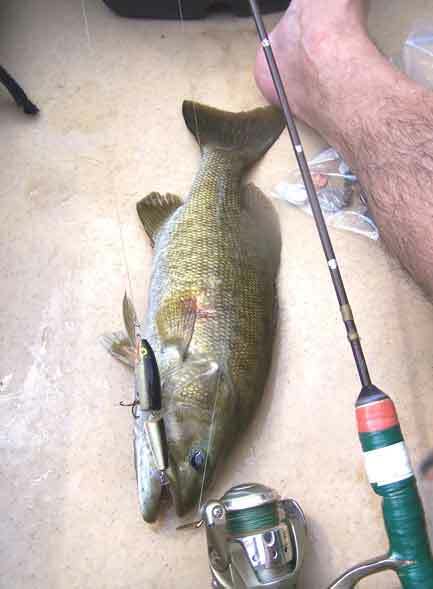 So I switched to a broken back rapala and this nice hefty smallmouth exploded under it and almost broke the line. 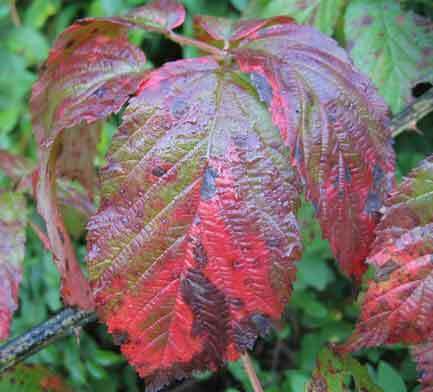 Blackberries are long gone and the leaves are turning beautiful colors. 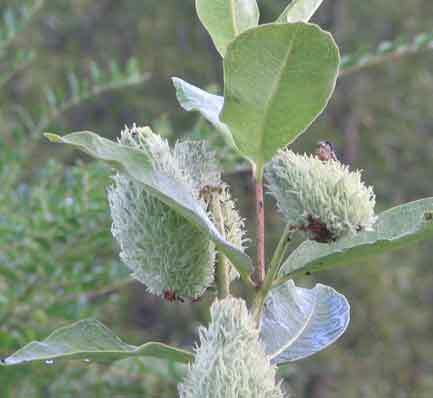 Milkweed seed pods are beginning to swell. 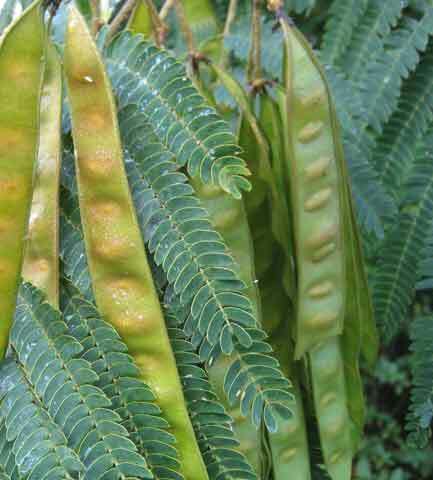 Mimosa beans are growing and will soon dry and burst. 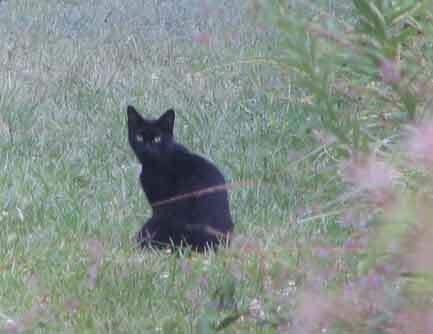 One of the neighborhood cats was hunting along the same trail I was. 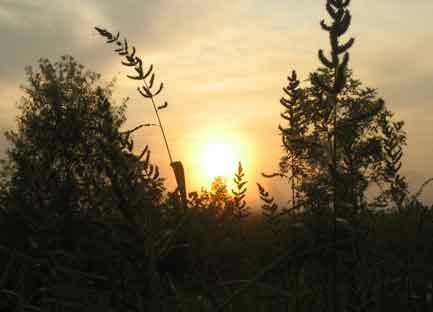 Rising sun across the foggy field. 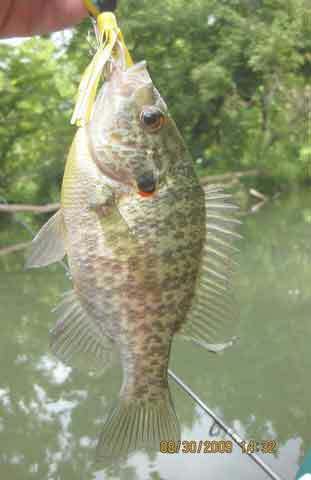 Harry caught this red ear sunfish on a hula popper, an old lure that is still a good one. 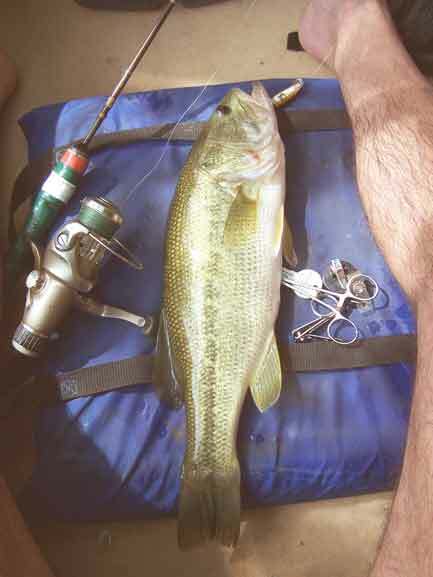 I stuck to the broken back rapala and got this 17" largemouth. Just after this I caught a small mouth that was also 17 inches, but my camera decided to run out of battery power just at that time. Oh well. Just imagine this one brown without the stripe and you'll have it. 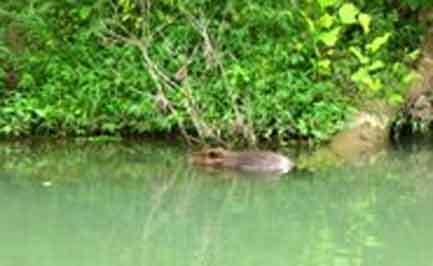 We were in our kayaks and Harry managed to steal up on this muskrat to get a shot before it grew alarmed and dived. 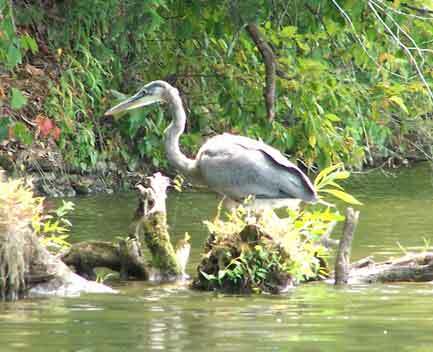 I got pretty close before this blue heron decided to head for less populated areas. Well, I still haven't caught up, but I'm getting there. 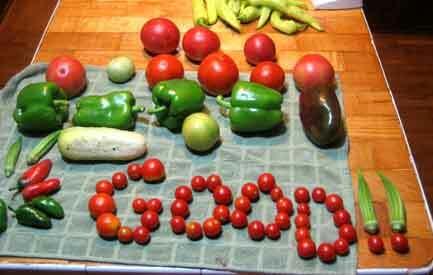 This is the season of harvest and all the good things in the garden, mine and others, are coming in hand over fist. The weather has been unusually cool, so the fish have perked up too. See what's been going on. Riding back from West Point Lake we stayed on the blue highways for quite a while. You see some mighty interesting things sometimes. 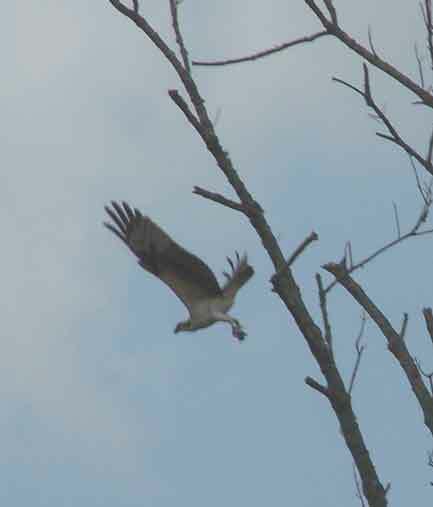 Back home I went fishing on Creek K and saw this beautiful osprey looking for a meal. 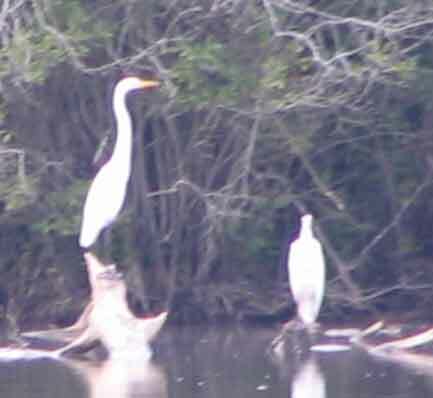 Further down the creek were these two common egrets.. 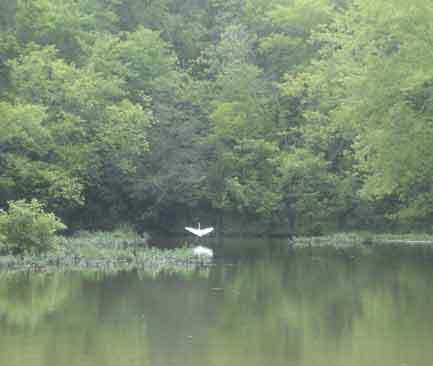 I've seen several now and wish they were called "beautiful egrets" or some such.. Not much luck fishing, but the old jitterbug brought in one small mouth. Friend Tom gave me his old faithful 14' jon boat. Now I'll see if I really want a bigger boat. My little 12' has been mighty faithful and easy to maintain for many years. 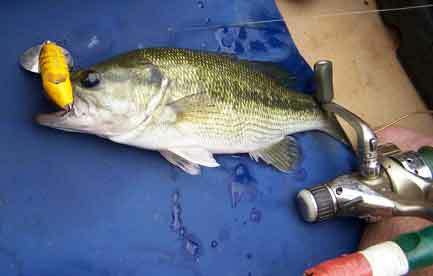 Do I really want a trailer and trolling motor? We will see... 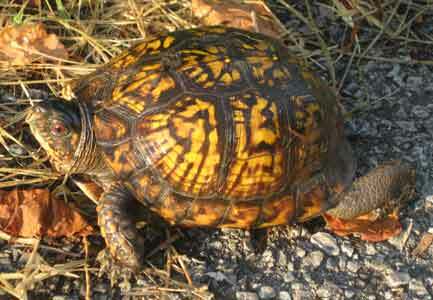 This box turtle at SB early on Tuesday morning let me get a good shot. 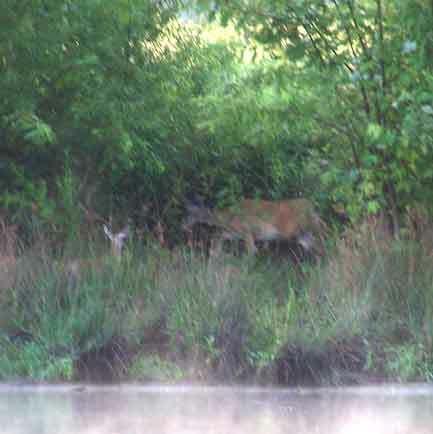 Mother and baby deer were across the pond and left before I could get a better shot. Good to see the new generation is coming along fine. 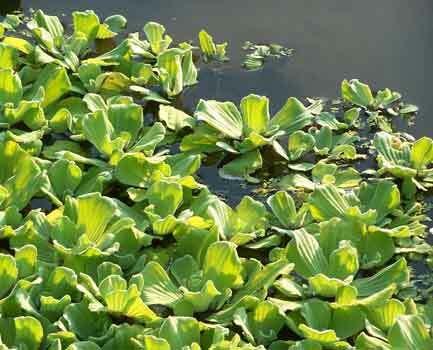 This water plant is growing in the corner of the pond. It's something new, so I hope it isn't another invasive alien type. 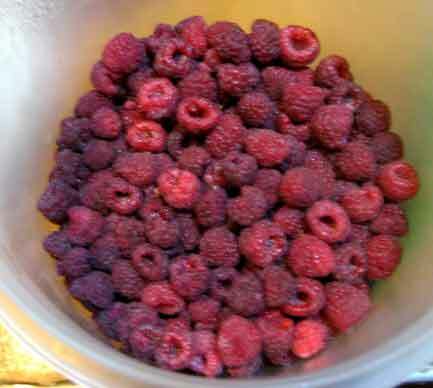 My friend Milwant invited me over to his garden to pick raspberries. He is certainly a healthy 80 something. Hope I make it that long and that well. Here are some of the fruits of the labor. Sherry made some delicious raspberry crunch and raspberry pancakes. We also shared some with the grandbabies. 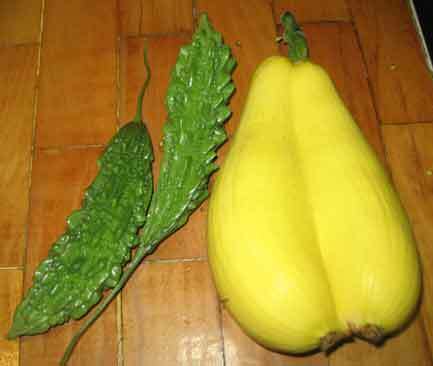 A double squash from my garden was interesting. Also, another gift from Milwant, bitter gourds. 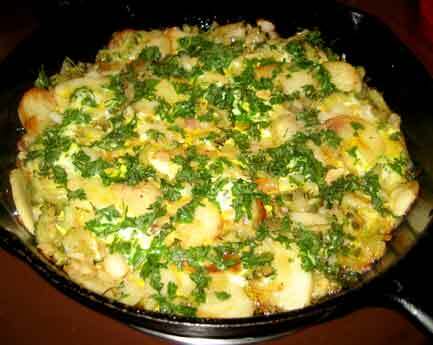 I looked up recipes and decided to try... ...them in a spanish "fritata,' a potato omlet. They were pretty bitter, but not bad and I can see where people might learn to develop a real taste for it. First outing in Tom's boat. I took it to the Harpeth River at Dozier's on Sunday. Little did I think it would be crowded with houseboats, jet skis, and even water skiers. I finally found a creek off the river and got some peace and quiet. Disturbed another of the common egrets, although they are so beautiful I don't like the tern "common." No fish, but at least I didn't get run over by a jet ski. Left early to avoid the crush. No more Dozier's until it gets cold. Lots of good things coming in now. How about this message. Right ON! 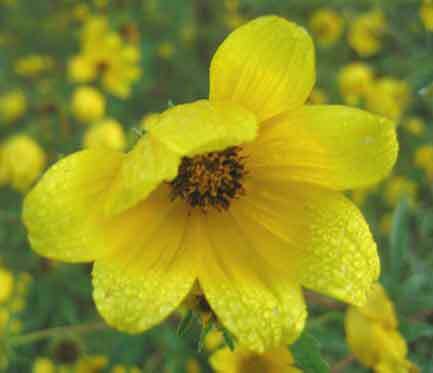 These yellow flowers are all over the huge field by the pavilion. 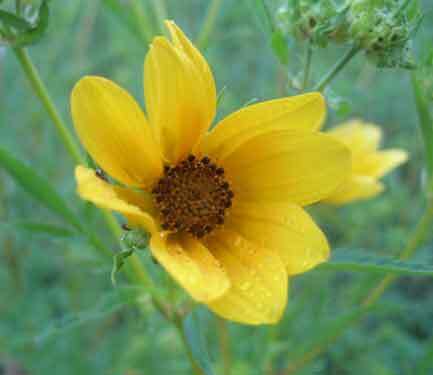 Whatever this mystery yellow flower is, it sure is nice. Yellow is the theme at SB these days. 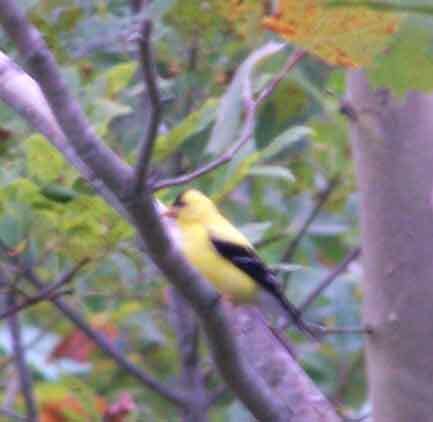 The gold finches are in their prime. Well, we have had rain when we needed it for the most part and some nice cool weeks. I think we set some cool weather records in July, so who can complain? I'm really getting behind because there is so much to do outside I just don't have the time to catch up. 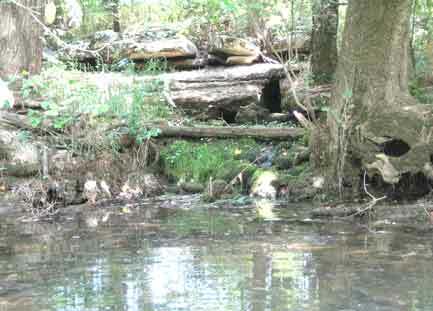 This is where the spring comes into Creek F. The cooler water attracts bass, but the area is under a huge low-hanging tree and the branches make it really hard to put a lure under there. 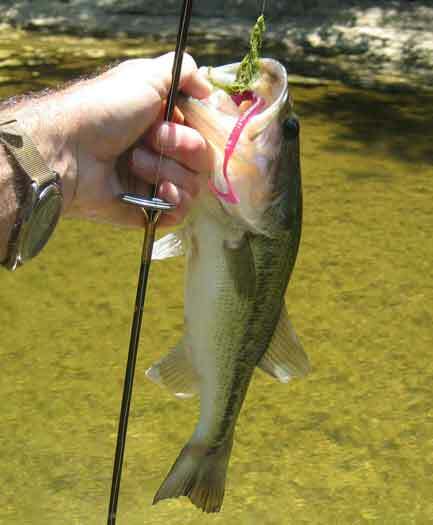 This 13" largemouth fell for the old purple worm with no weight, so it sinks slowly and wiggles on the way down. It's good in the moss since it misses most of it. 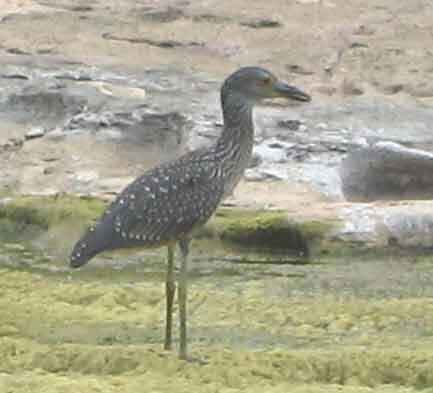 I don't know what this wader is. Anyone have an idea? 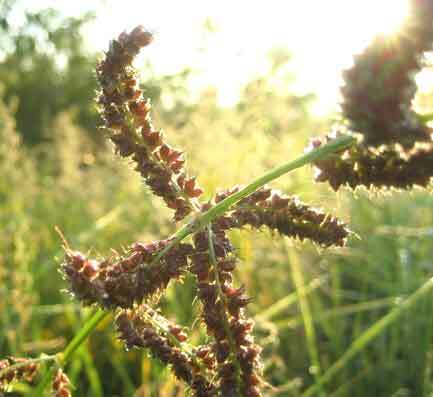 It's very early at SB and the low morning sun is backlighting these fluffy weeds. It's eerie and beautiful as well. 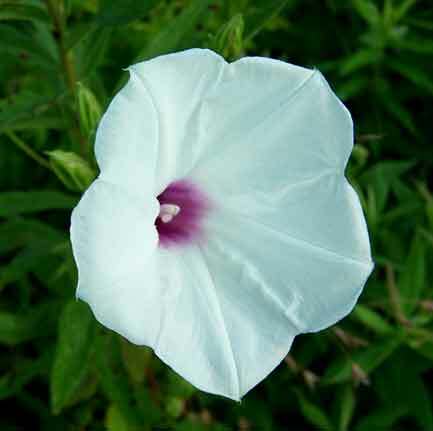 Another really beautiful morning glory. This one is at Bell's Bend Park where Kenny and I went on the 16th. 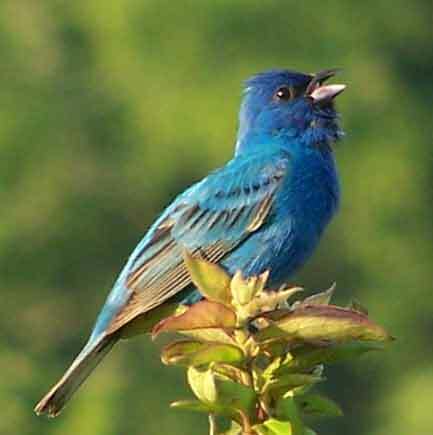 Got a lucky close shot of an Indigo Bunting at Bell's Bend. 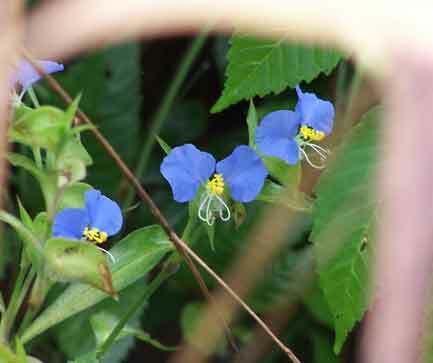 These really fine flowers are Slender Dayflowers, according to my expert. 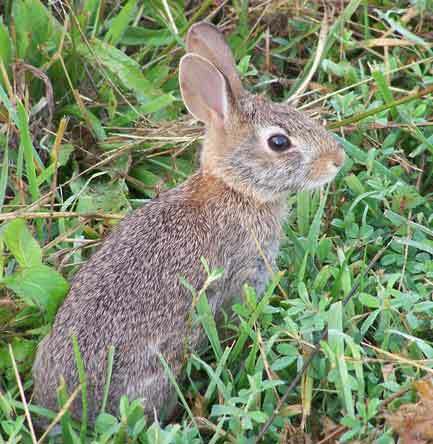 Lots of baby bunnies too trusting for their own good are out. This little bird could fly, but just barely. All the little babies are trying to grow up. 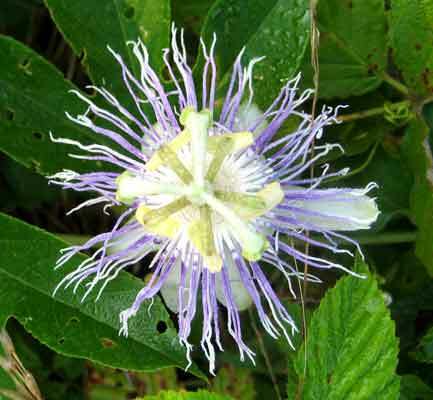 The passion flower is the Tennessee state flower. It's a Maypop vine. 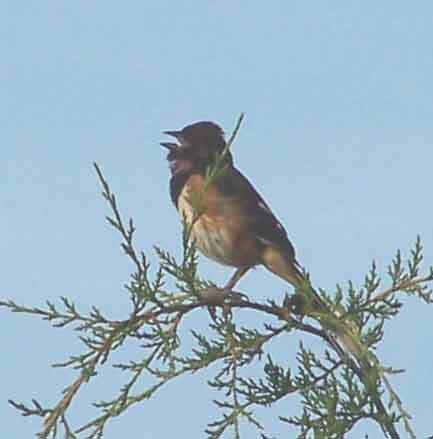 I'm not seeing many towhees now. 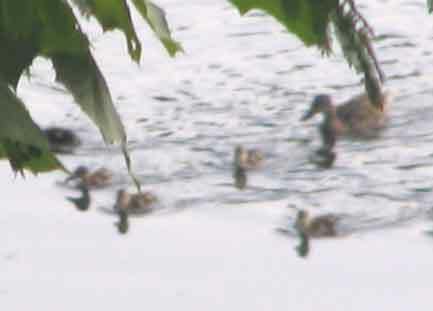 Most are done courting. 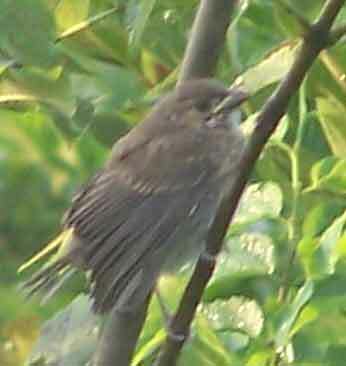 Some, like this one, must have had poor luck earlier. 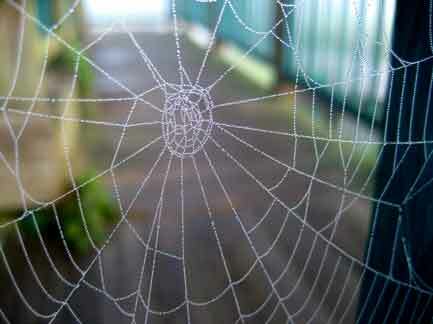 The dew made the spider webs very noticeable this morning. 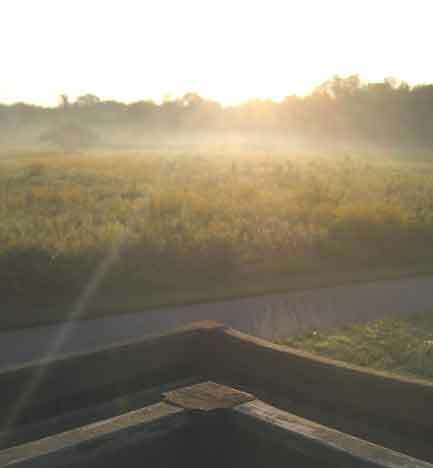 This one's at the pavilion at Shelby Bottoms. 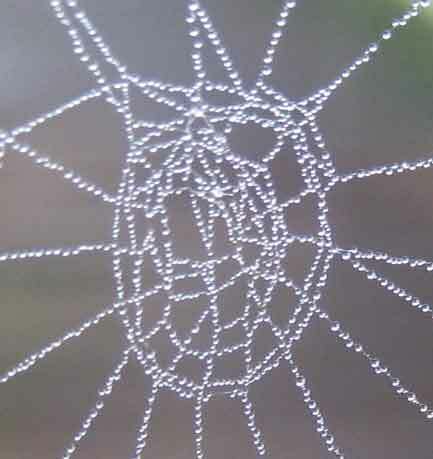 The dew is like pearls on the web. 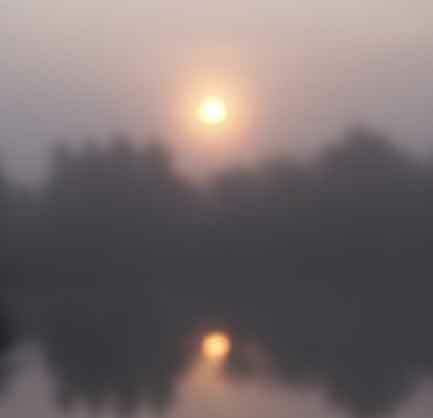 Hazy and damp this morning makes a great shot of the sun over the pond. 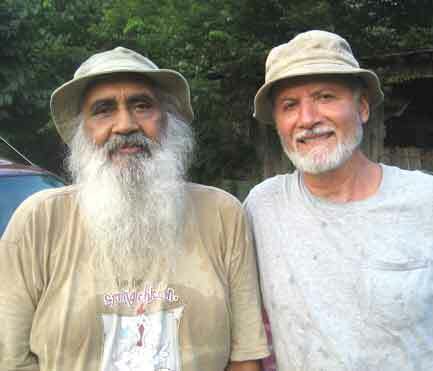 My friend from yoga class, Al, has a huge garden on his land in the bottoms of the Cumberland River. 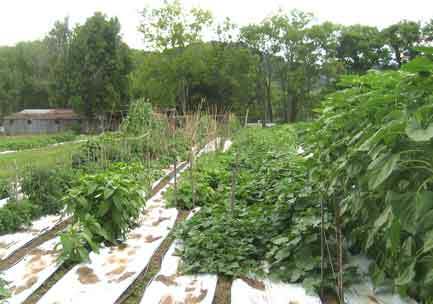 The rich soil make everything grow like crazy. The plastic is black on the bottom to shade out the weeds and white on top to reflect sunlight onto the plants. Seems to work. 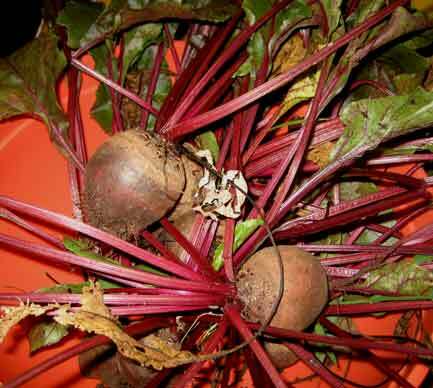 Our beets aren't growing too well this year. Probably too much shade. 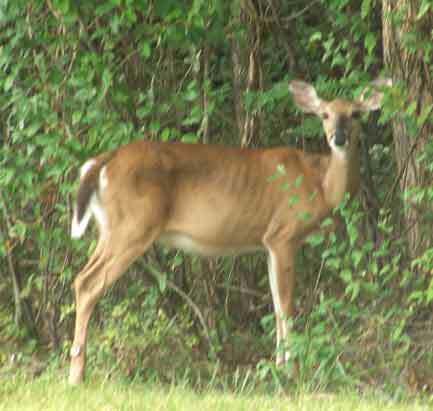 I hope by next year to cut back some trees in my neighbor's yard. Have to wait until the garden is done, though, since the falling branches will fall into the garden. 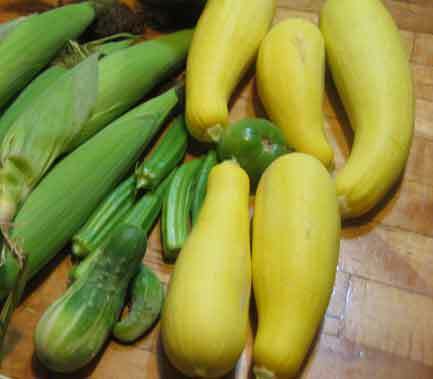 The corn is from Travis, but the cucumber, okra, and squash is from here. On Sunday the 26th I tried my old Jitterbug on Creek J and did well. 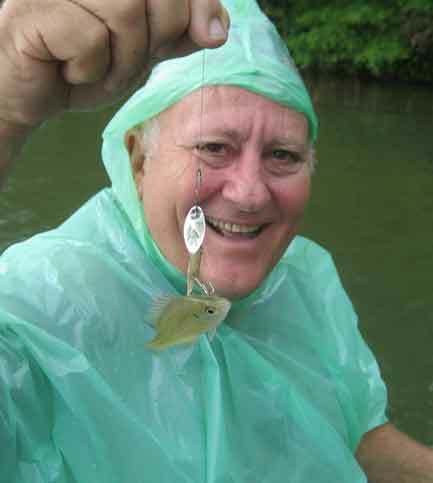 It's fun to fish because the fish attack it so viciously. Bam! A heart-stopper. 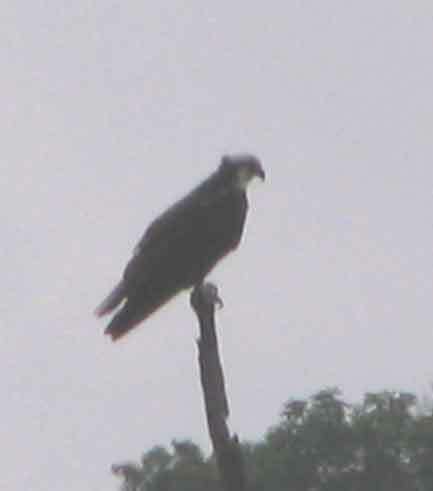 A pair of ospreys are regulars at Creek J where I fish it. 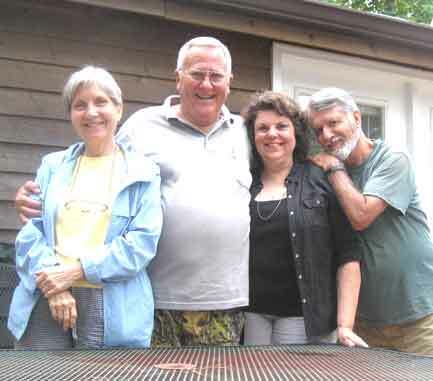 We met Frank and Mary Lee in West Point, Alabama, to fish the huge lake there, one of those on the Chattahoochie River. 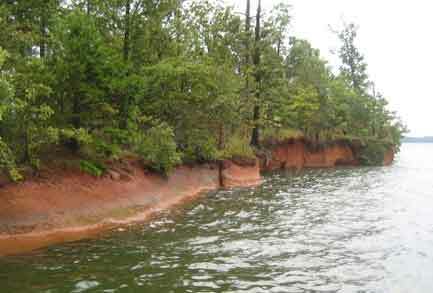 Those are red clay banks where the water falls off to 20'. Weather was stormy and rainy off and on, but we managed to give it a try. Fished out of a rented pontoon boat minus an anchor or a trolling motor, so we mostly blew where the wind wanted us to go. Caught nothing but worked hard at it. 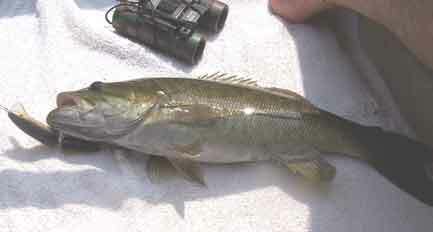 Well, we did catch a few of these guys, so we weren't skunked. After we pretty much gave up on fishing we went to get the girls and drove around a lot. 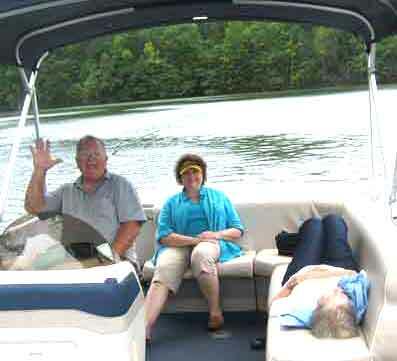 Here are Frank and Mary and a napping Sherry. 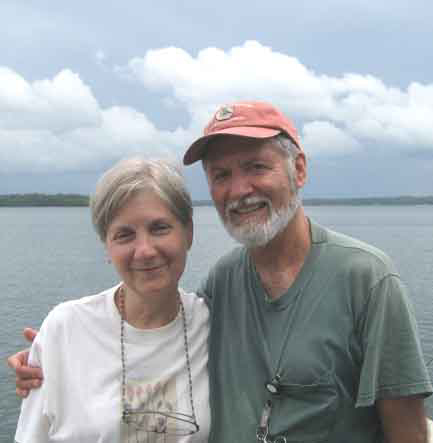 Frank took over camera duties and got a shot of me and my sweetie. After fishing and cruising around all day we cleaned up and went to eat, but the dock owner let us take the girls for a late evening cruise, since we had had such a rotten day to fish. The wind finally calmed down at sunset. The dock is easy to find. We just followed the flash of the lighthouse. Our cabin was very nice and big with a bathroom for each bedroom and a big living area between. All in all a very nice trip. Well, I had to dig up some of the potatoes. They were dying. Suspect a virus that causes the leaves to curl and wilt. Anyhow, they had nice tubers, although many were still small. 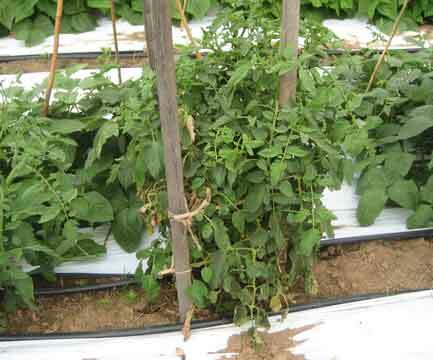 The other plants are still OK, although not fully healthy. Must be more resistant. We are now getting squash at both houses and Travis has tomatoes if she can beat the mocking birds to them. James and his gang of helpers got the deck started and now only the decking and rails are needed. 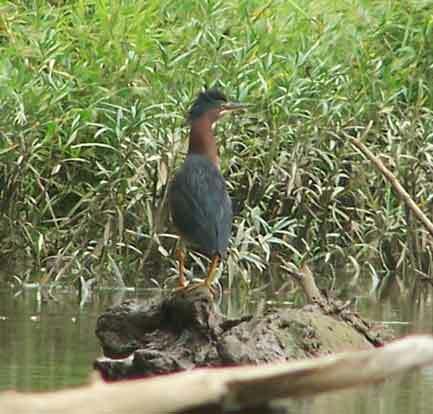 Got some good bird shots at Shelby Bottoms and we got rain just when we needed it. Just after work on the deck was over for the day on July 4th, and not until work was over again on July 5th. We weren't able to get outside on the night of the 4th to shoot off our bottle rockets and roman candles, but they will keep until next year. Good times. Good memories. Gave up on the telescope with the camera mount. 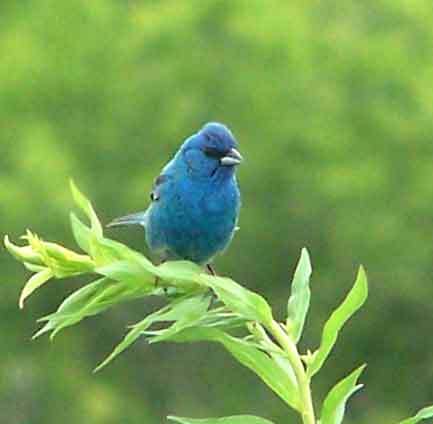 It was too slow and cumbersome for these little nervous indigo buntings. However, luck is... ...a lot better than skill. I did have my camera mounted on the tripod, used with only one leg extended-so really more of a unipod, when this one landed 20 feet away and began to sing his courting song. The length and weight of the unipod helped steady the camera although it wasn't grounded. These are the best shots of an indigo I've gotten so far. Thanks. 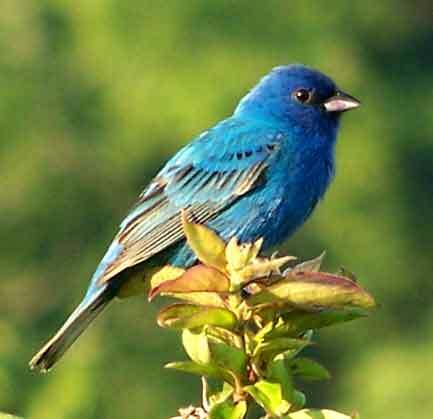 Right after getting the photo of the indigo bunting along came Kenny from my yoga class. 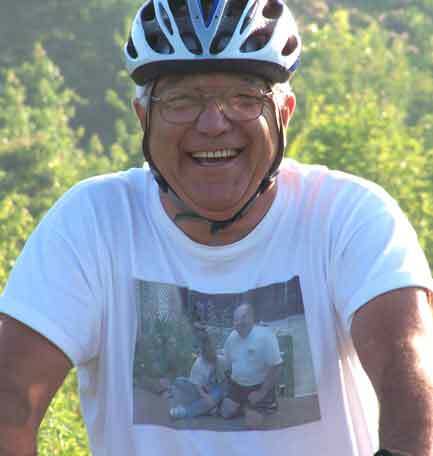 He rides his bike a lot and was on his way to breakfast at the Hermitage restaurant across from the old General Hospital. He eats there almost every day and loves it. 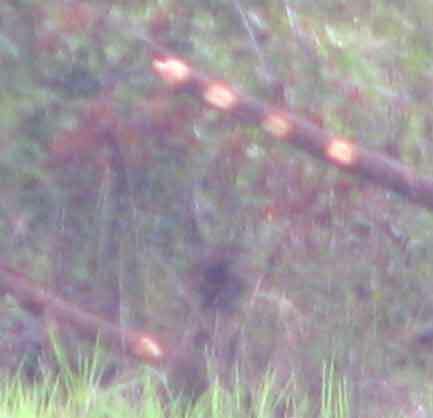 The light spots are swarming nats flying around the bush. Why? Ask them. 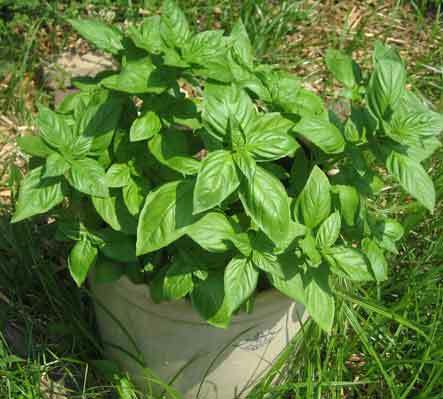 The basil I planted in the crock is doing well but the dill failed to make it. 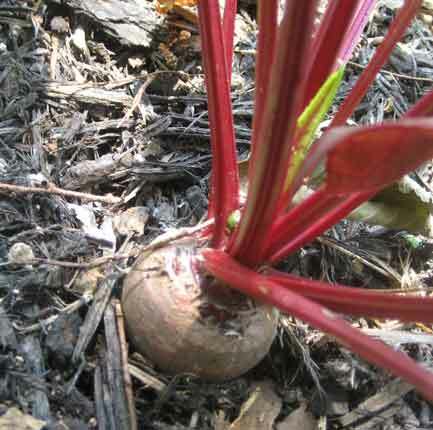 Got a few beets getting near the eating stage. Won't be long. 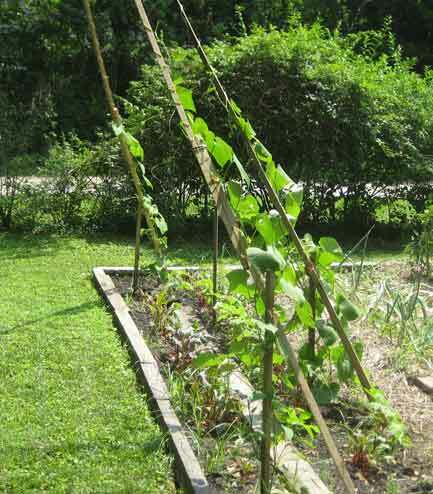 Some of the chayote plants are half-way up the poles. 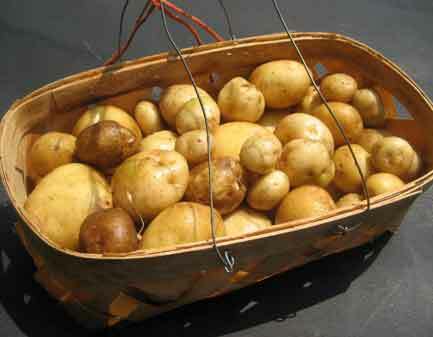 These are the cleaned potatoes from the plants I had to dig early. 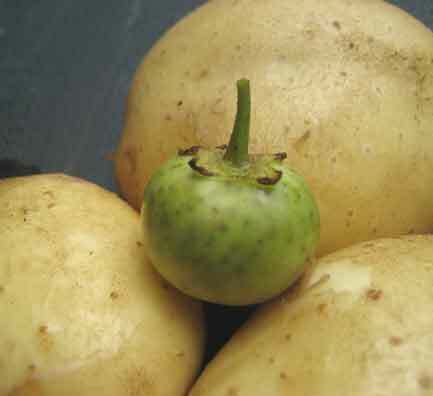 I found this berry, or whatever it is, growing at the top of one of the potato plants. Any idea what it could be? 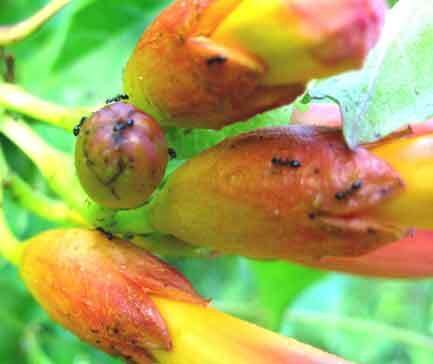 The ants like the bases of these trumpet vine flowers. 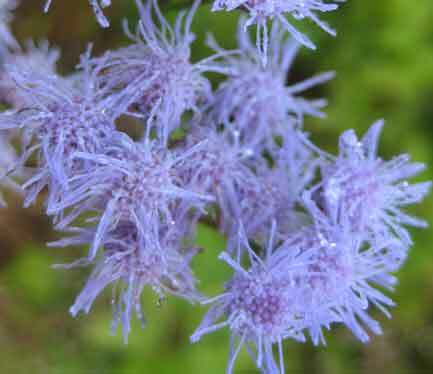 Here is a young Queen Ann's lace blossom that hasn't unrolled yet. 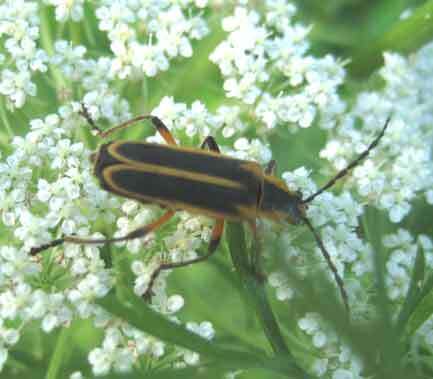 And here is a beetle that lives in the flowers. 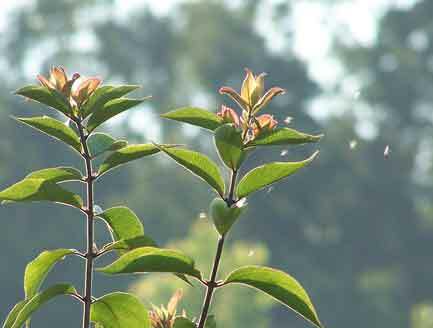 Probably eats aphids or such. 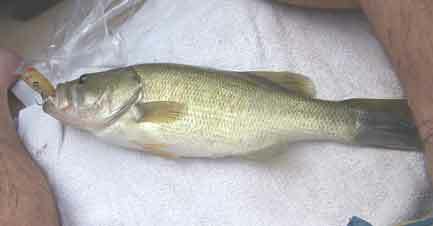 Tried my luck at Fall Creek and caught this one nice bass on a purple worm with only a hook and no weight. On the way back to the car I saw this pretty thing on a thistle flower. 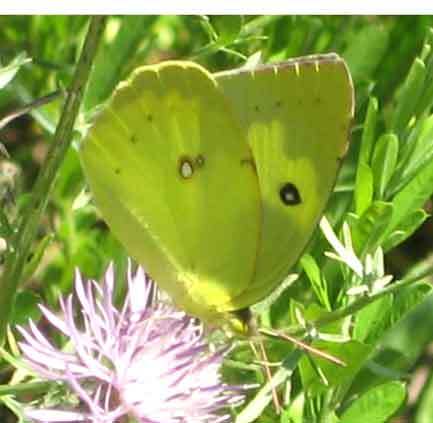 I think it is a yellow sulfur. Anyone know for sure? Click here if you do. 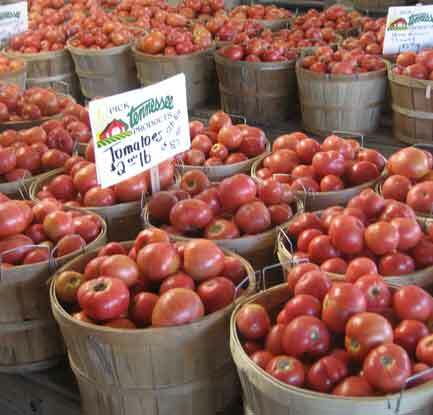 Smiley's at the Farmer's Market finally has ripe Bradleys. Mine are still little green things, although Travis has some if you can get them before the birds do. 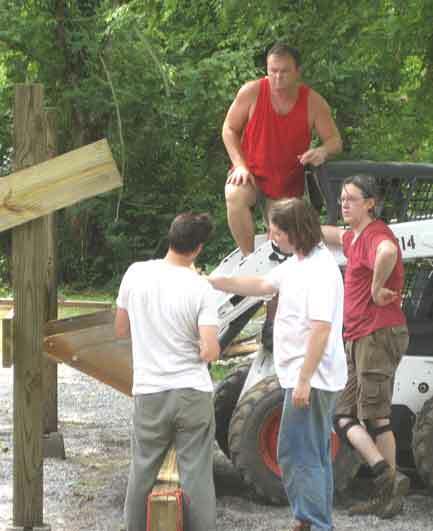 James and his volunteer deck building crew on July 5th. Bill is waiting until the guys decide the best way to lift the 20 foot beam on top of the posts. Hanley and Doug have their say too. Finally, all the angles studied and plans made, Bill cranks up the bobcat and lifts the beam which climbed slowly to the top like clockwork. No injuries and no problems. Tommy and I made a trip to Green Field, Tennessee, which was dumb. 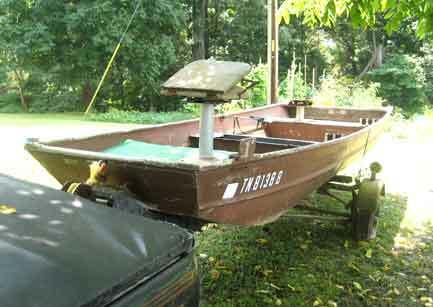 I went to look at and possibly buy a fishing boat I saw on Craig's List. 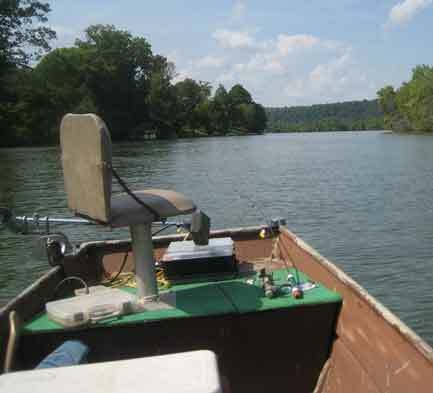 The boat wasn't what I wanted so we wandered back across the north border of Tennessee. 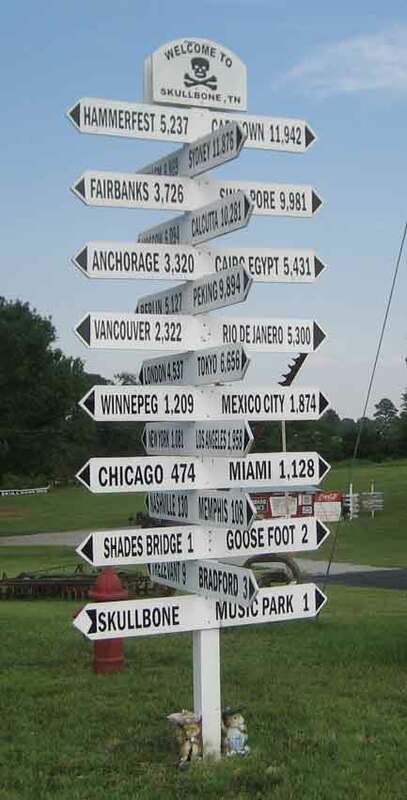 Much farther than we figured. Didn't get home until 11:30 (part of I-40 was down to one lane). Still, we did make a stop at this interesting little town. Actually, the store is more or less all there is to the town. 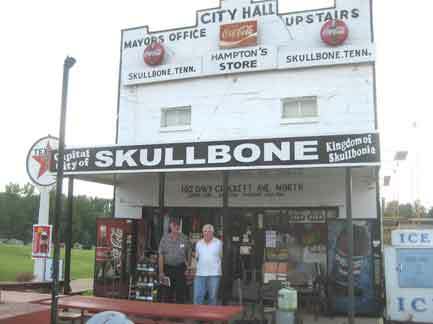 According to Mr. Hampton, at the store, the music park once was a lively place with Opry stars and visitors from all over. 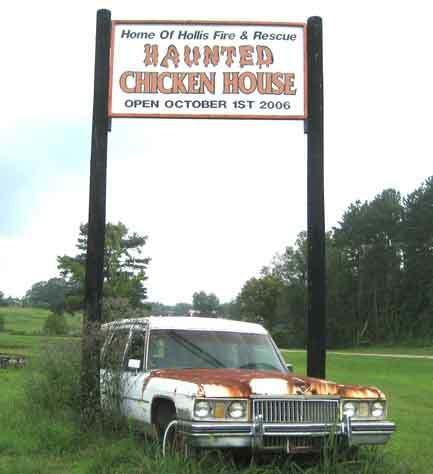 It's closed now. 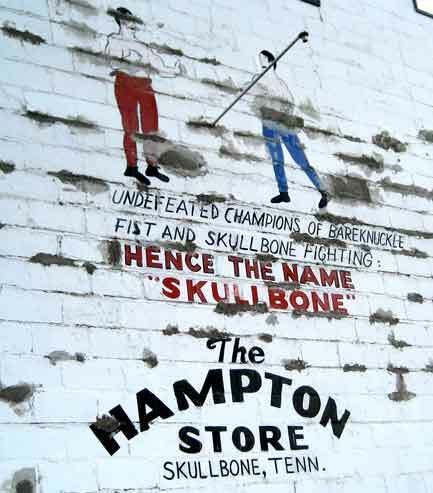 Mr. Hampton said that the name of the town came from a type of bare-knuckle fighting where hitting below the "skull bone" was illegal. Who knows? 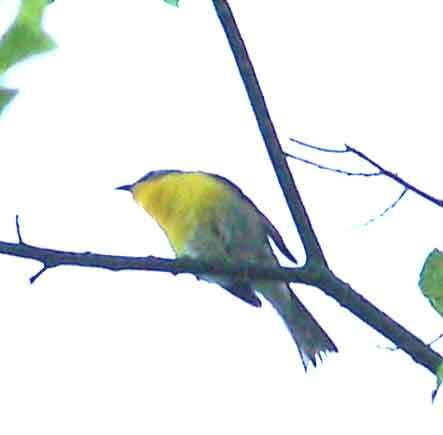 Thursday I got this shot of a yellow throat. 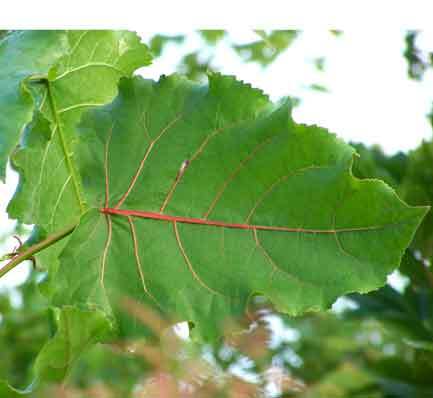 Interesting leaf. 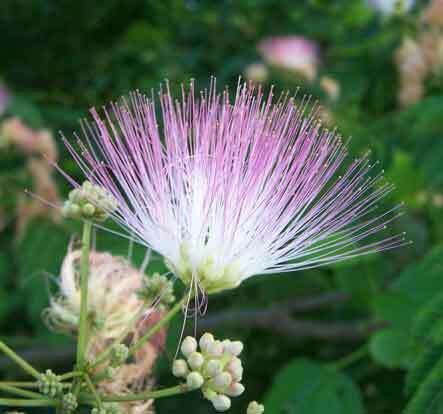 Mimosa flowers are really nice. 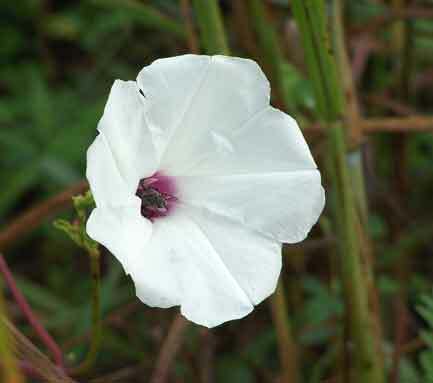 Morning glories are as well. 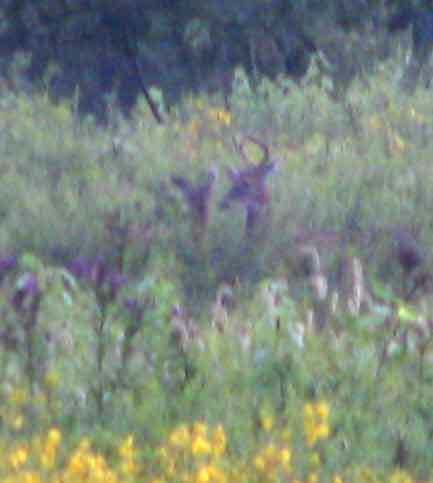 Out in the field near the pavilion I saw this buck and a doe almost hidden by the growing weeds. After the guest workers went back home James had the hard part done. 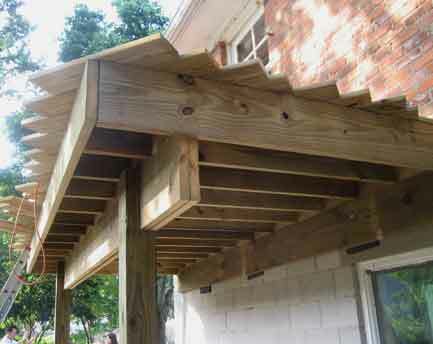 Now he can finish the decking and rails without needing a helper. It's going to be nice when finished. Here's that big beam they were lifting. 20 feet long by 12" X 6". That is a heavy load. 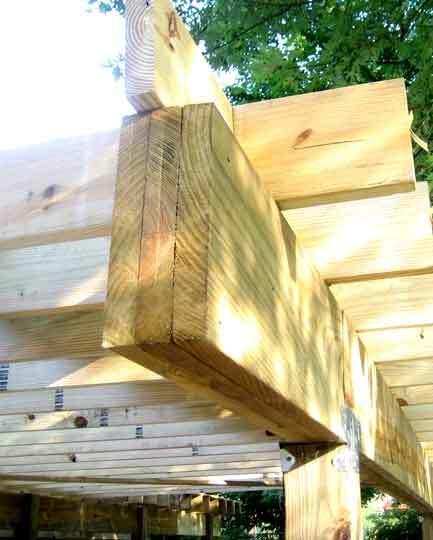 Shouldn't have to worry about this deck shaking. 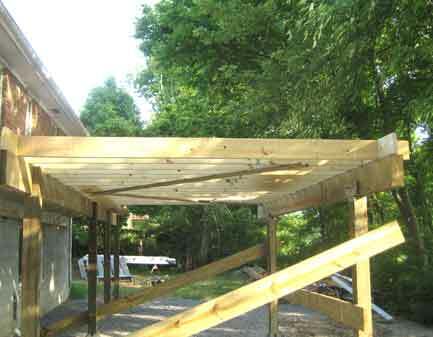 This separate small deck is just for the master bedroom. Nice.